Castilla-La Mancha (central Spain) is a region characterized by significant agricultural production aimed at high-quality food products such as wine and olive oil. The quality of agricultural products depends directly on the soil quality. Soil geochemistry, including dispersion maps and the recognition of baselines and anomalies of various origins, is the most important tool to assess soil quality. With this objective, 200 soil samples were taken from agricultural areas distributed among the different geological domains present in the region. Analysis of these samples included evaluation of edaphological parameters (reactivity, electrical conductivity, organic matter content) and the geochemistry of major and trace elements by X-ray fluorescence. The dataset obtained was statistically analyzed for major elements and, in the case of trace elements, was normalized with respect to Al and analyzed using the relative cumulative frequency (RCF) distribution method. Furthermore, the geographic distribution of analytical data was characterized and analyzed using the kriging technique, with a correspondence found between major and trace elements in the different geologic domains of the region as well as with the most important mining areas. The results show an influence of the clay fraction present in the soil, which acts as a repository for trace elements. On the basis of the results, of the possible elements related with clay that could be used for normalization, Al was selected as the most suitable, followed by Fe, Mn, and Ti. Reference values estimated using this methodology were lower than those estimated in previous studies. 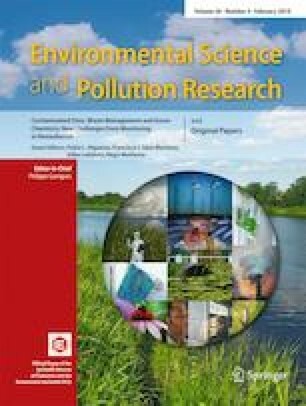 This study was funded by the Castilla-La Mancha regional government (PPII10-0063-8230) and by the Spanish Ministry of Science and Innovation (Grant CGL2015-67644-R).